I found this interview from 1980 pretty interesting, it talks about their studio, recording techniques and a bit about live shows. This link is no longer up and/or working. Do you have a working link? Bellairepark73 wrote: :shock: This link is no longer up and/or working. Do you have a working link? Journey is a five-piece band, with Neal Schon on guitar; Gregg Rolie, keyboards; Steve Smith, drums; Ross Valory, bass; Steve Perry, vocals. Journey is also much a team effort, not only on a musical level, but also on a recording and management level. The first feeling I had when walking in to do this interview was that I was dealing with professionals: no-one was stoned out, appointments were promptly kept, and even during the interview, the recording process rolled smoothly along. Production and engineering chores are shared by Kevin Elson and Geoff Workman, although it seemed to me that Kevin is more production oriented while Geoff concentrates on the engineering. While Kevin had never produced any albums entirely by himself prior to this project, his engineering work on Lynyrd Skynyrd's Street Survivors, demo work with .38 Special and Molly Hatchet and particularly his handling of Journey's "live" sound for the past several tours certainly qualified him for working on Departure, the group's sixth album. Geoff Workman has worked extensively with producer Roy Thomas Baker; his list of engineering credits includes an amazing array of albums from early King Crimson to Queen, Foreigner, Journey, the Cars, and numerous others. Second engineer Ken Kessie rounds out the production team. Kevin is articulate, deliberate, and clearly gives a lot of thought to how to best realise a particular sound. Geoff, on the other hand, has that glint-in-the-eye characteristic of any mad scientist. He would much rather twiddle knobs than talk about how he twiddles knobs. In fact, the first thing he said when he came in for the interview was that if Kevin had told me what I needed to know, that was fine with him and he wouldn't be miffed if he were left out of the story. He keeps a low profile, and being called something like a "super engineer" would probably embarrass him more than anything else. Before letting him get back to recording, though, I did manage to get some interesting comments concerning the recording process. Geoff is not a person whose words translate easily onto the printed page. The words come out in big enthusiastic clumps that may, or may not, have anything to do with the question being asked. But this didn't strike me as a sign of flakiness; rather, this guy is a likeable pro who doesn't give a damn about publicity and is secure in his own abilities and attitudes. The members of Journey were happy with the way things were going in the studio. There was no evidence of friction or malaise, and everyone seemed pretty loose. When Neal walked in with some new guitar gadgets, everyone paused long enough in their work to be properly appreciative. Considering that Journey has developed its following through constant touring and persistent management as opposing to cashing in on a hit single and burning out, this type of closeness and professional attitude seems appropriate. But now they have a hit single too ("Lovin', Touchin', Squeezin'," which became a hit eight months after it had been released), and the future is looking very bright indeed for this San Francisco-based band. Modern Recording: Did you feel any need to change the Journey "sound," or is the current project a continuation of previous albums? Kevin Elson: The last couple of albums have been mainly vocal oriented. My background is more as a straight ahead rocker. In past Journey albums, I've felt the bass and drums didn't stand out well enough and were not properly heard in the mix. This album also represents more facets of the band, because they enjoy playing lots of different music. There's real good rock, some ballads, a little blues, some jazz this album is a departure in the sense that there's more variety of material. A lot of solos, and even some vocals, have been done "live" so there's more of a feel. We're not as picky as in the past; if something feels good, we go with it. All the musicians are happy with the results of this approach. MR: Journey had a lot of success with [producer] Roy Thomas Baker at the helm and I would think there would be a tendency to go with a proven winning combination. How did you come to be the band's producer for this project? KE: I came into it because I was doing their "live" sound, and I started doing some "live" tapes. They came out really well, so CBS decided to put out some "live" material for the FM stations, and the response was good. Also, the band didn't care for the mastering on Evolution and some of the singles, so I re-edited "Lovin', Touchin', Squeezin'" and re-mastered it. I got a different sound that they were real happy with. When it came time to talk about producers, the band decided that they wanted myself and one other person to collaborate closely on getting the album together. The other person was Geoff Workman, who at that time was working with Roy Thomas Baker on the Foreigner album. MR: Was Geoff co-producer with Roy on that album? KE: No, he worked strictly in an engineering capacity and Roy was the producer, period. Geoffrey had no say in the production, but he did the bulk of the work and we felt he was responsible for the sound. I've worked with some really good producers and have seen how the input of a producer works, so when it came time to make a decision, I definitely wanted to work with Geoffrey not only because of his talents, but also because of his all around attitude and good humour. We finally put the production package together in September of '79. MR: So you feel much of production involves attitude . . .
KE: Yes. Both Geoff and I come from a non-technical background; in fact, we both started out as keyboard players. I've always been concerned primarily with the sound, and didn't care what it took to get the sound I wanted. MR: Do you feel your musical background is helpful, or does it get in the way of being a more effective producer? KE: It's helpful. I feel that the people who have written a song know what they're looking for better than anyone else. I try to bring out the best possible performance from the players. The main thing is that with a musical background, there's an easy relationship with the musicians. Say, when Gregg is looking for a unique sound, I can understand what he's talking about because I've been in that position before. It's also easier to relate musician-to-musician in terms of getting a good bass and drum sound. MR: So you're pretty much in an equal position with the players, it's not "the producer as God?" KE: Oh yeah, exactly. We discuss everything. If Geoff and I have an idea, we'll try it, and if it doesn't make it, we'll move on. I was involved in the pre-production, so things were well prepared before we even went into the studio. We haven't had to stray much from our original ideas. MR: Why did you choose to record at the Automatt [Recording Studios, San Francisco]? KE: Journey had done the last two albums in Los Angeles, but didn't feel real comfortable because they had to be so scheduled. So, last summer their management talked with David Rubinson (the Automatt's owner). One of the best things about the studio is that it has an excellent "live" room that we wanted to use. At that time, that room had a rented Neve [console] and was in the process of being refurbished. They ended up selecting a Trident console, which also worked in our favour since Geoffrey was very familiar with it. The Automatt has what we wanted: a good room, good board, good outboard equipment and good people. The only change I mad . . . well, I didn't particularly care for the monitors. So I brought in some JBL 4350s, which I'm really used to hearing. That was the only real change. MR: You don't feel you have to go to L.A. or New York to get a good sound? KE: No, not at all. The Cherokee room in L.A. is a good-sized room, but it's a little smaller than the one we're using now and we had to do things like tear down equipment between sessions. Here we don't have to worry about that. MR: How did you prepare for the recording of the album? KE: It all started on the road with collecting songs and album ideas. Once the ideas were down, we'd rehearse them during sound checks. We came into the studio with nineteen songs and put down fourteen basic tracks. We'll select eleven for the album without getting into too much of a time problem. MR: Was any material worked out in home studios beforehand? KE: Yes, Neal Schon has an 8-track system at his house using a Teac 80-8 with a Sound Workshop board. We endorse Electro-Voice products, so they supplied us with microphones and such, which helped keep the cost down. With what we're doing here mixed on a cassette, Neal can transfer the cassette over to his 8-track and experiment with guitar leads, check out harmonies and things like that to see what will work. That saves time, which is one thing you want to do with expensive studios. It really is important for a band to be well prepared that's what pre-production is all about. MR: Are you trying for any particular "sound," like a thick sound or a bright sound? KE: Not really, we're just trying to come up with the best sound for each song. Without a doubt you'll know that every cut is a Journey cut, but we're not looking for anything anyone has done before. Some songs need more vocals, some more bass; we concentrate on whatever makes the song stand out. MR: Do you therefore approach recording as more of a documentary of the "live" sound? KE: The attitude of this band is that we want to be able to reproduce this material "live" like it sounds on the record. We don't want to do outrageous sound effects, or overdo it on banks of vocals and guitars. Our approach is towards making the best quality record, so we do use the studio where appropriate; after all, playing "live" compensates for any little extras you use on an album to get the sound across. But we won't have an orchestra come in to do string parts, we'd rather use synthesizers. MR: I understand Roy Thomas Baker has a very different approach, going for a big sound with massed vocals and such. Did the band not like that? Or did they go for it initially, then change their minds when they had to play it "live"? KE: They liked it at the time, because it fit the material they were writing then. We could try that now and it would probably work well with some of the cuts. They were happy with the ideas Roy had . . . that's a hard question to answer, really. What I think he did best was handling the vocals, since he brought out the vocal lines very well. 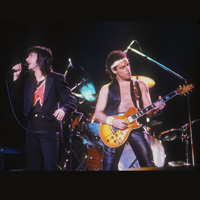 Steve (Perry) has a lot of his own ideas, but Roy's contribution was to integrate the voice well with the band. ME: Journey has always stuck me as going for a powerful type of sound. How do you translate power into the restricted range of an album? KE: Basically, we try to record very hot; we use a lot of room miking to get the ambient quality of the room, which is another reason why we go for the big room. We put as much level as we can on the tape, which makes it a bit stronger and puts the sound right up front. With close miking sometimes the sound is too separated. It works well with some records, but it's not the right approach for this time around. MR: Geoff, how do you feel about close miking? Geoff Workman: I'd sooner have a band utilise the whole room and have close visual contact so that they don't feel like they're sitting in a box somewhere. In that respect, you sacrifice separation . . . but I like to use a lot of room mics anyway, maybe four room mics on a drum kit. Obviously that's going to pick up some bass and guitar, but that's an integral part of the overall sound, and to try to eliminate it seems rather pointless. I've been using distant miking techniques for as long as I've been engineering; one mic in front of an instrument doesn't always capture the sound you want, although it's fine for some material. I couldn't see, for example, a Steely Dan or Earth, Wind and Fire record approached in the same way I approach recording. My technique matches the bands I work with. MR: Do you mix the ambient sound onto separate tracks? KE: We have stereo front and stereo back ambience tracks, and we also have an ambient guitar track in addition to the close miking track. MR: Geoff, do you have problems with print-through or leakage with high recording levels? GW: I've never run into those problems, even with the Stevens 2", 40 track. If you isolated every single track, you might find something bleeding through; but no more so than you'd get from the mic bleed. No one's going to hear it. MR: Do you agree that tape saturation sometimes gives character to a sound? GW: If you record a snare drum and really crank it on there, the limitations of the tape and tape electronics become part of the sound. A lot of times this sound is desirable. MR: So you'll trade off feedthrough for feel anytime . KE: Well, we figure that if we still feel it after hearing the thing so many times during recording, then when people hear the album, hopefully they'll feel what we felt. Most of the basic tracks are done "live," and so are some of the solos and vocals. MR: How do you cope with hearing the same pieces of music over and over again? KE: It does get a bit ragged sometimes, which is a good time to walk out of the room and play a game of pinball! We decided to do the basics by giving a couple of shots at the songs we had planned to do that day; if it didn't work out after a couple of tries, we'd move along to the next song. If it didn't happen, we figured we'd get it another day. We moved along really quickly, and did fourteen basic tracks in fourteen days. KE: No, a lot of what we have is first- and second-take stuff. We'd go ahead and try a 3rd or 4th take to see if we could get a better feel, but things would actually decline after that point. We took a pretty carefree attitude. We'd see how the band felt when they came in; if they were in a joking mood, we'd do a rocker. If they were half asleep or kind of relaxed, we'd do more of a ballad type of thing. It all relates back to a feel and closeness between producer and artist. We hang out together, we go out drinking afterwards together. MR: Do you think your attitude has been influenced by the New Wave backlash that regards rawness and intensity as more important than perfection? KE: Well, I don't know . . . maybe after the very disciplined type of approach Roy used in the past, I think the band was ready for a change. I've always had that type of attitude anyway and so has Geoff. MR: When do you schedule your sessions? KE: Our rehearsal schedule was 10am to 3pm, although we go a little longer in the studio. Journey is comprised, pretty much, of early people; they're not real blazers, where they go to 3 or 4 in the morning. They like to use the daytime, when there's the most energy, and have the night off to do whatever they want to do. If you've got business to do during the day and then go into the studio, you'll be worn out. We felt a daytime schedule would give the most productivity. MR: Since you don't have much of a technical background, what do you do to keep up with the state-of-the-art? Do you find yourself omitting options because you were not aware of them at the time? KE: I constantly deal with people who are updating equipment because of the "live" work I do, and it's much the same thing as working in the studio in terms of equipment. I learn more from working with things than I do from reading about them. I'd like to know more, but just don't have the time to really study up on that type of training. I think if I did, I might tend to record in a way where I would think too technically. You know, not trying something because I've been told it's the wrong thing to do. A lot of the people I associate with will say try this or try that, so I get a lot of word-of-mouth learning. Geoff, of course, works year round in the studio, so he's up on all the latest gear. Neither of us can tell you how something works, but we know how to use it. MR: Geoff, how do you feel about electronic effects? GW: The electronic effects that are available now at the touch of a switch are very good, but you don't come close to the effects you used to get by working over a 4 track all day. Nothing will every re-create the sound of true tape phasing (flanging), or a tape machine going at 60 ips for a DDL effect. Electronic effects just don't seem to have the character of what you are able to get with tape. Ohm's law is of no consequence to recording music, and I even lose track of microphone model numbers and all that. I'm always willing to prostitute a certain piece of equipment, short of damaging it, such as creating a fuzz sound by cranking the mic gain. Engineers who disagree would tell me you can't do that, it will distort! But of course, that's what I wanted to do that was the noise I wanted. What's happening now with university courses and all that is that you're going to end up with a glut of engineers who are brilliant theory-wise but it's the two flaps on the sides of your head that count. Your ears, not a machine, should analyse the sound of a room. I always carry a reference tape with me of something I know well, like the last project I worked on, then I let my ears tell me how the studio affects that tape. GW: Oh, I use a lot of EQ, sometimes more than a lot of people would think is necessary. I'll boost a particular frequency on record and on playback, for example. But if it sounds right, it's fine. I don't go back and feel ashamed because I added 19dB or something. The way I adjust the parametrics on this board is I just pull everything out, and sweep everything until I can find the frequency I'm looking for so I can boost it or cut it. I don't predict, "That must be between 800 Hz and 1.2kHz" and work from that premise. MR: Did your career begin with 4-track recording? GW: I started engineering in 1968, and that was straight stereo on a lot of dates. Then 4 track, ping-ponging and all that. The first King Crimson album was all done on an 8 track, with humongous amounts of bounding back and forth, back and forth, then mixing it down into stereo and hand syncing it back into the track again. That's probably why I find splicing tricks and stuff like that to be real easy. My forte was chopping up pieces of tape, and putting them in backwards, or using tape phasing, or whatever. MR: Many engineers who started on 16 track can't do things like that . GW: People still don't realise the easiest way to get backwards tape on some machines is to lift the tape and put it around the back of the capstan and in front of the pinch roller. As long as you have someone there paying attention to the tape motion, and you disable the erase head, this is a lot easier than flipping the tape over, changing the monitor balance and figuring out which track is which when the tape is backwards. MR: Are you using any noise reduction on this project? KE: We're not using any at all. Running the tape at 30 ips and recording louder music means you don't really need noise reduction all that much. GW: When Dolbys first came out, they were w necessity because recorders and tape weren't all that good. But as tape became better and better, and machine became better, the need for noise reduction was reduced especially with rock material. There's nothing recorded at a low level that's going to be prominent in the mix later. KE: We use a combination of Urei Compex and dbx. MR: How do you choose one over another for a given application? KE: They all have readily identifiable "sounds". The Urei has a harder sound that works well with guitar and keyboards. Dbx on the bass gives a rounder, punchier sound and the Compex works great with vocals. Why, I don't know. MR: How do you define a "good sound" for limiting vocals? KE: Well, you don't hear the real limiting happen. It's very smooth as it limits; you don't hear any sucking. Steve (Perry) has a lot of range and can hit some real strong notes, so you need a limiter that's not obvious. MR: I take it you're not a purist who feels limiting destroys the sound. KE: I'd prefer to ride gain with someone like Ronnie Van Zandt because he sang in pretty much the same dynamic range. That's what I do with Steve "live", but it doesn't work out too well in the studio. With the Urei, you could hear him hitting. I don't think it was our doing. I just think that different devices have different sounds. MR: How do you record the drums? KE: We're using Sennheiser 421 microphones on the toms, because they accentuate the sound. A lot of people will use the Shure SM56, but for the toms we like the Sennheisers better. We used 56s on the snare. MR: How does your mic selection process work? Do you have certain mics you like, or do you try different ones all the time? KE: There are certain mics I'll use all the time on drums because they do a good job, but for room miking and guitar miking it will vary quite a bit. I picked up an old AKG D12 on tour in Europe, and it's got a kind of ribbon sound . . . there's a boost at 100 Hz, and it's perfect for a kick drum. Just put it on flat and it's got an amazing sound. MR: So you'd rather take a mic with personality than use a fairly colourless mic and add equalisation? KE: Yes, although it also depends on, say, how the drums are tuned. Steve (Smith) is very particular about the tuning of his drums and heads, so that makes mic selection just that much more important. Most of the problems I've found with drummers involve getting snare sounds; some want a real "snare" sound, and others want a boxy midrange sound. I like a fat sound, myself. MR: Do you use any direct injection? KE: On the synthesisers we have mics on the amp system he's going through and we have directs. That way we have a choice of what we want to do with the individual sounds. Synthesisers taken direct tend to sound kind of buzzy, whereas a speaker will tend to smooth all that out. The main synthesiser we're working with on this album is the Prophet 5, and it's amazing. MR: How do you feel it compares to other synthesisers for recording? KE: Basically, you know what kind of sound it has before you have to start laying it down; there's no patching or other complications. I've never worked with modular systems much. MR: Does the Prophet have tuning or drift problems? KE: Yeah. In the higher registers, when you're playing full chording you have to be careful, since the high octave note might flatten out a bit. I don't know if it's the nature of the instrument, or whether this particular one just wants a trip to the shop. MR: You can always set everything an octave lower and record at half speed the avoid upper register problems. KE: Well, single notes come out just fine, and Gregg's still using the Mini-Moog for certain sections. It's pretty much a trouble-free instrument. MR: Are you using Neal's Roland GR-500 guitar synthesiser much on the album? KE: Yes, we're using it on a couple of background filler-type sounds. When we were in Japan, we got some extra equipment that extended the versatility of the unit. Neal likes gadgets a lot, and loves the GR-500. MR: Have there been problems in integrating the synthesisers into the tracks? KE: Actually, it's all falling together pretty naturally. The keyboards and guitars are pretty much clean and up front, and the synthesiser is more or less in the background. MR: Sort of like a string synthesiser. MR: Are there any special effects you like to use while recording? KE: Gregg likes an Eventide Harmoniser set at 1.01 with his voice; that's one example. I personally like using tape recorders for delay, because the sound is ultra-clean and natural. Instead of phasing the cymbals, we'll use variable speed delay on the MCI multi-track to give a "wash" of a sound. We use more natural things than actual special effects. MR: Are you using 24 tracks, or two 24-track machines synched for 48? KE: 48 tracks was an option, but we felt that id the band knew they had two machines they could keep playing with, things could go on forever. We haven't had to sacrifice anything with the 24, except that we've had to put some vocal tracks on early so we could mass them together without running into track space problems. MR: What sorts of things do you look for in a board? KE: One of the most important features to keep the musicians happy is a good cue system. Otherwise, it causes synchronisation problems with the basic tracks if they can't hear each other properly. MR: Doesn't the Automatt have some kind of special cue system? KE: Yes, it's called Automix, and it gives each musician four different cues that he can mix. The Trident has a separate monitoring board, with found cue sends that either echo or monitor sends. We'll give the bass one control on the musician's mix box, drums another control, guitar/keyboards the third control and finally vocals get their own control. This allows each musician to get his own personalised cue mix. Our hardest problem in recording the basics was that what came through the headphones was like a transistor radio compared to the sound the band was getting in the room. But for a board, as long as the muting is quiet and there aren't any bad faders . . . as long as the board is clean, you can adapt to different EQ setups and any other minor differences between boards. MR: Is there any type of EQ you particularly like? KE: One thing I like about the Trident console is that the slide pots on the parametric Eqs are faster to set up than rotary pots. On Harrison consoles, I like the fact that you can do a lot of basic EQ with the various low and high pass filters, and you don't even need to touch the EQ modules until mixdown. MR: What type of reverb do you favour? KE: I personally like a natural room chamber. The best I've ever heard is at Studio One in Atlanta. I can hear a song on the radio and tell by the reverb whether it was done at that studio or not 'cause the reverb sound has a certain edge to it. I asked Rodney Hills (the designer) how he got that sound, and he said it was the first one he had ever done and he had no idea how to recreate it. But if you listen to the Atlanta Rhythm Section, Alicia bridges, or Skynyrd's Street Survivors, there's a certain quality to the chamber that's unmistakeable. Here at the Automatt, we have stereo EMT, Lexicon digital reverb and a "live" chamber. When we get into mixdown, we'll use the EMT on some of the guitars and room reverb for the vocals. MR: You mentioned a "live" album earlier. Is this something you've been recording all along, and you'll just have to cut and paste what you want to make the LP? KE: The "live" tapes started out as sound for a radio show, but the tapes turned out really good. We won't have to do any fixing in the studio. We have about seven reels of tape, and we'll sit on those while we record this tour. Then we'll pick the best from the lot. We're using the same truck for all our recording to get a consistent sound. The most important thing to me is that I believe you can record a "live" album almost anywhere. To tell you the truth, I prefer a big, boomy hall to get the excitement of the crown and the excitement of the building. The ambient mic placement is particularly important, and I spend a lot of time on that. Also, instead of doing post-production effects, I feed all the effects lines to the mobile truck so I can do all the effects in real time. This means that when it's come time to mix, I mix just like a "live" show because all the tracks and all the effects are there, I think a "live" album is the feel of the audience and the band, so I'm careful not to make the sound too clean. MR: This relates to the earlier question of how you fit a powerful sound into those little tiny record grooves . . .
KE: It is hard. Mastering is the whole key to the thing, actually. Whatever you do here [in the studio] doesn't matter if you are going to end up with a rotten mastering job. MR: Do you do the mastering yourself? KE: No, I supervise the process but wouldn't know how to do it myself. George Marino at Sterling Sound [in N.Y.] does most of the things. I used Artisan in Hollywood for a re-package compilation we just did. I like to get people who want to be the best, who aren't just doing it as a job. MR: What production tool would you like to be invented from a technological standpoint? KE: To me, just the ultimate cue system. Studio equipment now is generally superb, and making the musicians happy is the most important consideration, because that's where everything comes from. MR: When mixing, do you ever use little speakers like Auratones? KE: Yes, for sure. When we listen to the final basics to pinpoint problems, the Auratones don't hide anything. At high volume with good monitors, it's bound to sound pretty good no matter what. You don't have that happen with Auratones. MR: Now that you've become so involved in the process of recording, will you continue to do Journey's "live" sound? KE: I really enjoy doing six months a year in the studio, and the other half of the year on the road doing "live" shows. The "live" side of it is a real challenge. The P.A. system I use is like a giant studio monitor system no radial horns, just a big paper system that's really smooth. Certain groups sound good on this system, but other groups couldn't use it. Real raunchy groups need 18-inch horns and that overkill radial horn sound. The system I use is from Canada, and was built for Emerson, Lake and Palmer. It's the same system that Yes, Billy Joel and Fleetwood Mac use. From those groups, you can see what's needed in the sound: punch on the drums, good vocals and a clean sound. You can be sitting in the audience on-axis with one of those cabinets and it won't destroy you like a horn would. MR: That makes me more inclined to see a Journey concert. I'm the type of person who wears cotton in my ears at concerts. KE: I don't blame you. How much I like a group depends a lot on the system. I've had to mix Journey on horn systems overseas, and Steve's voice hits right in the horn range. It can not even be loud and still kill you. MR: What would the two of you advise musicians to do to make life easier for the producer? GW: Oh dear, there's a question. Well, the guys in Journey and me have a lot of running gags going! Seriously though, there are three different categories of producer/client relationship. One is purely business relationship between band and producer, where they don't really meet except through their lawyers. The there's the producer/engineer, but that's a little split for me because I have to do two things at once. The third situation is what we have now, where Kevin works with the band all year round, he knows the equipment, the members, the material, everything. I've worked with Journey on two previous albums, so we all know each other well and there is a particular kind of trust. They know I'll record them well, I know they won't come up with a bunch of bad songs, and Kevin can keep an overall eye on everything. Every project is totally different, so different musicians need to do different things to adjust to different producers. Trust is really a terrible word to use, but that's what it comes down to. The band is putting its career in my hands, but for me, if the album doesn't come off, that doesn't reflect well on my talents. KE: One thing that would really help the producer is that in rehearsal, the band members should closely examine the rhythm section bass and drums. After getting material, it's good to let everyone else sit out and just listen to the bass and drums, to see if they're locking together right. As soon as things get tense because of uncertainty, the situation gets rough and frustrating. The saving grace is to have every person knowing what each other member is doing. Otherwise, you have to start restructuring in the studio . . . at $150 an hour. If everyone comes in well-prepared, it makes life so much easier. While Journey is undeniably a team effort, perhaps the most visible member of the group is lead singer Steve Perry, who also shares vocals with Gregg Rolie and the other members of the band. He had some interesting comments on the recording process, which follow below. MR: How did you decide to be a singer? SP: I played drums until '71 . . . I was a lead singer/drummer, like Buddy Miles, or the guy in Rare Earth, or the drummer in the Standells if you want to go back that far. Finally, my voice ended up surpassing my drum technique so I decided to be a singer. I play enough guitar to write songs, but I would never play it on stage. MR: How do you psych yourself up for singing in the clinical confines of the studio? SP: That's a major problem, and that's why I don't like working with certain producers, things sometimes seemed so sterile with them. MR: You mean they just sit there and say, "Roll the tape"? SP: No, that isn't the problem. You open your mouth first time of the day, and Lord knows, your voice would be filled with cobwebs; they push the talkback button with comments like, "That was dreadful." Two or three of those, and my balloon's out of air. The confines of this medium have enough things to psych you out . . . I didn't need to accumulate any new ones. MR: Why would you work with such producers if you didn't get along all that well? SP: Well, I'm just the singer! [laughs] There's more than one guy in this band, plus the record label has a secure feeling with a certain type of producer. MR: Do you prefer doing a "live" vocal and keeping it, compared to over-dubbing? SP: I do three complete vocal tracks, mix down the best part to a compilation on a fourth track, and let that give direction to the song. Then, I'll go back later and re-sing the track; sometimes it will be kept, sometimes it won't. MR: Do you find that bouncing destroys some of the continuity? SP: Well, you have to keep that in mind as you're bouncing. MR: How did you get interested in studio techniques? SP: I was working in a studio in Los Angeles as a tape operator, and did that for about two years because I couldn't find a gig. The producer working with me was an engineer there, so after hours we'd work on vocals to try and get me a demo. In the meantime, I was learning a lot about the studio. Prior to that, in my home, I had a two-track and learned a lot about editing and vocal stacking. I had an early sound-on-sound unit, and I'd do tons of ponging . . . back and forth . . . I'd found out about sibilance building up, tiny timing errors, that type of thing . . . what worked and what didn't. MR: How do you feel about limiting? MR: Does the whole group sing on choral parts or is it mostly you? SP: The entire band does a lot of singing. I don't have the same tonal quality as anyone else, so there's a real plus to the sound when you have a number of different singers. MR: You have a remarkably smooth high range. How do you keep it in shape? SP: I don't smoke cigarettes or pot to speak of. It's not that I don't dig pot, it's just that smoking has no place in my vocal instrument. Also drinking [alcohol] dehydrates you, and that's the enemy of your vocal cords. Your cords have to be lubricated, so I drink a lot of water. MR: How did you extend your range? SP: I can't really explain how my range increased. One day it just was there, and I have no idea how it happened. Sometimes the key to doing something is not thinking about it, and just letting things happen naturally. MR: Are there any effects you like to have on your voice? SP: The only thing I really like is a "live" chamber with a warm bottom. I like sibilance through an echo chamber; I prefer sibilance on the chamber sound instead of the basic track. It gives a kind of personal feeling. If you push a note real hard and put it into the chamber, it will hang over for a bit. You can then sing a soft note and the two will harmonise nicely. As far as electronic effects go, I'm not that interested. We'll do things that accentuate what I am, but we won't try to make me something I'm not. MR: Have you ever felt limited by being self-taught? Do you want to take additional training or voice coaching? SP: I'm just going to expand on what I'm doing now. If I start getting non-productive, or if my singing slacks off, then I might do something. Voice is difficult; it's temperamental, and it has so many variables. An instrument can sometimes be impersonal, but there's no way you can consider a voice impersonal.